We often wonder and ponder at the difficulties of hosting dinner parties (as you do, and as many will call this #firstworldproblems). First of all, it takes a while to prepare the food that you plan to cook. Second of all, the ingredients aren’t easy to come by and thirdly, food costs are not cheap (unless of course you’re serving everyone a can of baked beans on toast, then the costs and effort are miraculously low). Sometimes, you even fore-go the thought of dessert as you can’t bear to think of what to make. If you’re lucky, one of your guests will suggest that they will bring the dessert! However, if you happen to be like myself and usually use a sidekick (the Boy) to prepare desserts or have your desserts spectacularly fail on you (e.g. collapsed cake, aliens invading oven, the dish running away with the spoon), then “Hey Diddle Diddle!”, have I got a dessert for you. You do have to like chocolate though. You do like chocolate don’t you? How wonderful would it be if you could whip (literally) something out of the kitchen for a bunch of guest in a minute? Well folks, here is the miracle 30 second chocolate cake. Yup, even less than the minute that you couldn’t spare. It’s wondrously discounted by 50%! 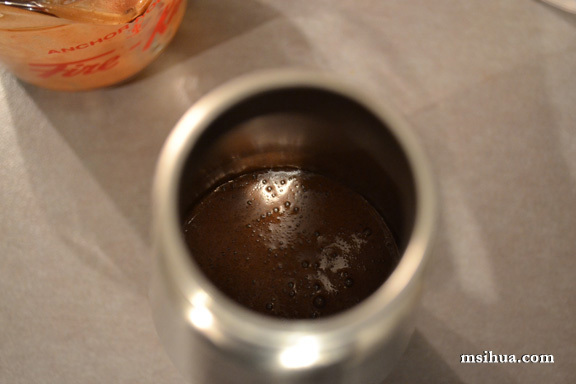 Melt chocolate in a microwave-safe bowl using a double boiler or microwave. Allow it cool slightly once melted. Add eggs, flour and sugar with the chocolate and thoroughly whisk together until well combined. Pass the chocolate mixture through a fine mesh strainer to remove any lumps. 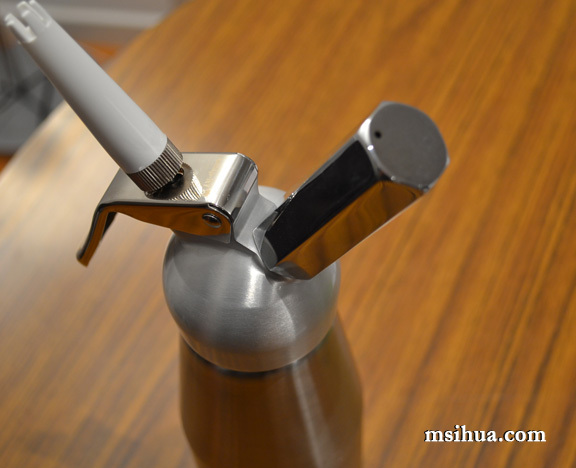 Transfer mixture into a cream whipper and charge with 1 N2O cream charger (or 2 charges if using a larger cream whipper/making a larger batch of cake). Give the whipper a good shake. 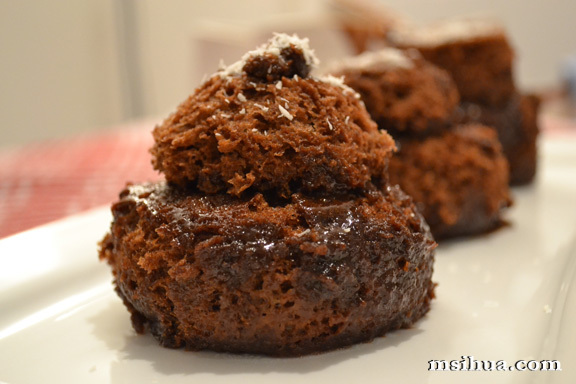 Spray chocolate mixture into greased ramekins or other microwave-safe container/glass. 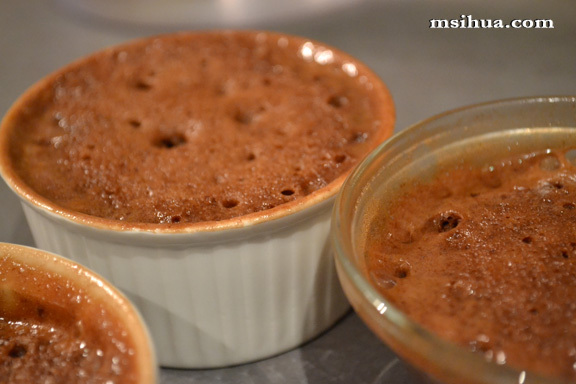 Fill only 2/3 of the ramekin to allow cake to rise. Put your ramekins onto a plate as it can get a lil’ bit messy if your mixture starts to overflow. Microwave for 30 seconds or until the foam has set. Note, that it took us more than a minute for ours to set because we used larger ramekins as well. The smaller ramekins managed to set in 30 seconds. Once done, loosen the sides and flip onto a plate. Decorate with icing sugar or in this case, we used dessicated coconut. But anything works! And there you have it, instant chocolate cake (or mini cakes). It might not be the prettiest of cakes but the flavour is intense and texture is moist and spongy. Be creative and experiment with different shapes or flavours. So if you ever run out of ideas, or have a kitchen misadventure (seriously, the cutlery does keep stealing away the crockery), this recipe is fail safe! OH MY GOD aliens invaded my oven just the other day as well!! Fortunately, I’ve now trained my cats to be Attack Catz so I think I have solved that problem. If you ever need dessert brought to your house – I’m your gal. PS: If your alien problem is persistent, please see a sci fi author immediately. Hmm, I don’t have that gadget at home. Buy it online! It’s worth it.. only just because it’s so much fun! not exactly 30 seconds total time but hey i take 30 second cooking time anyday than wait for it to set in the oven! It really is just 30 secs for the cooking time.. doesn’t include all the prep work, but hey.. no more long waits for the oven if you’re craving chocolate cake! Oh goodness! There’s no escaping these crafty aliens is there?! Eeep! This is worlds of awesome! 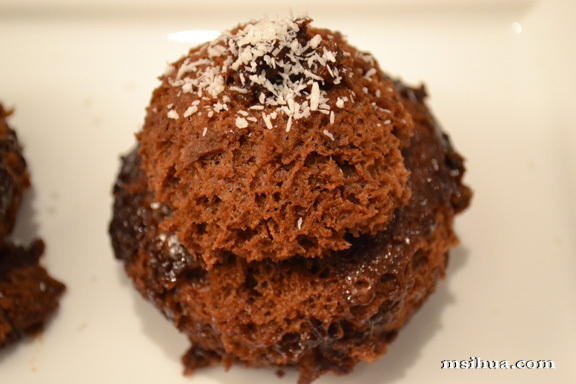 Even quicker than my peanut butter chocolate mug cake recipe! Awesome! Together with your BFF, you could both save my life from invading aliens and just crash my place with dessert! You’re in!